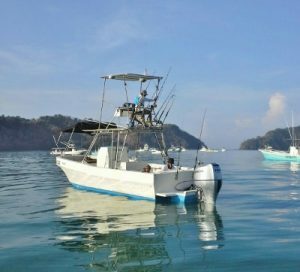 This newly rebuilt 29ft Panga Center Console is powered by a single 120hp Honda outboard. Captain Tomas Villalobos is often at the helm, assisted by an English-speaking mate. Cruising at 26kts, she is especially equipped for inshore fishing, with custom rods and a full range of Shimano gear. She has an indoor head, live well, VHF radio, and all the required safety equipment.